Who Wants to Cross Stitch Famous Feminists? The new book Feminist Icon Cross-Stitch by Anna Fleiss and Lauren Mancuso is a fun book full of stitched portraits of famous feminists and fun slogans for all the badass women in your life. 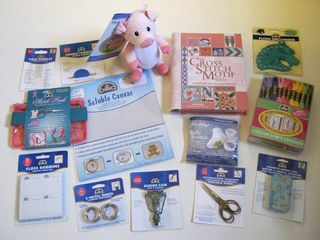 Over at Craftside there are free Easter cross stitch patterns and two big prize packs filled with all sorts of stitchy goodness and books. Enter to win both packages by midnight ET on April 13th, 2012 Learn more…. Over at the Kooler Design Studio Blog, they are sponsoring another great giveaway! 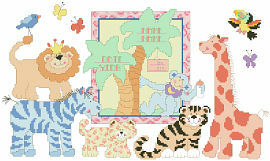 Get this cute Zoo Babies Birth Record Chart. Wanna win this cute little pillow? Head over to Happiness is Cross-Stitching to find out how. The official release date for the first wave of Liz Westlake’s new Semi-Solid Collection for Dragonflylotus Designs is just under 2 weeks away, which means she’s decided it’s giveaway time. Over at Craftside, not only do you get a “behind the scenes peek at a crafty world,” but right now, you can also get a chance to win the new book shown here. Just a reminder, there are a few more days left for our Kooler Design Studio 12 Days of Christmas Design Giveaway. It’s time to announce the winner of the Cross Stitch Kit giveaway! 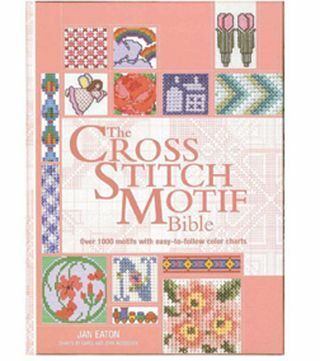 Yiota’s Cross Stitch was nice enough to provide 3 cross stitch kits to a winner anywhere in the world. There were 82 comments, so therefore 82 entrants.